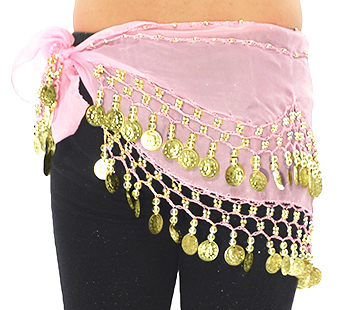 Your little princess will love this imported hip scarf made especially for little belly dancers. Intricate beadwork and metallic coins will give her a glamorous look and sound, making dance more fun! Perfect for stage, parties, or Halloween costuming. I just bought this for my daughter for her first year on the Shimmy Mob team, and I am so extremely happy with it!!! I was nervous that it would be too big for her, but its perfect! It has really boosted her energy during rehearsals. I even snapped a picture of during one and posted it on the wall of the Shimmy Mob Facebook page. Big hit with my 5 and 8 yr old nieces for the Saturday night beach drum circle!